Angie Elliott, CLA, NCCP is a Paralegal/Office Manager employed at Crabtree, Carpenter & Connolly, PLLC in Durham. She has been involved with various paralegal organizations over the course of her twenty-two year career. 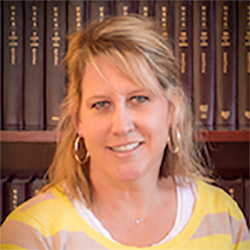 Angie holds a Bachelor of Science in Administration of Criminal Justice from the University of North Carolina at Chapel Hill and completed the Meredith College Legal Assistants Program.